“Woohoo! It’s spring!” you say. “Time to bust out my floral rompers and sundresses!” How many of you think like that on the first 70 degree day of the year? I know I do! But over here on the east coast, early spring temperatures can be super volatile. Just a week ago (in February! ), I was outside in a t-shirt. I was like, “This is great! Winter is over!” Today? Not so much. I had to bundle up in a long parka just to run an errand! In a few days, temperatures will be back in the 60 degree range. Talk about unpredictable! 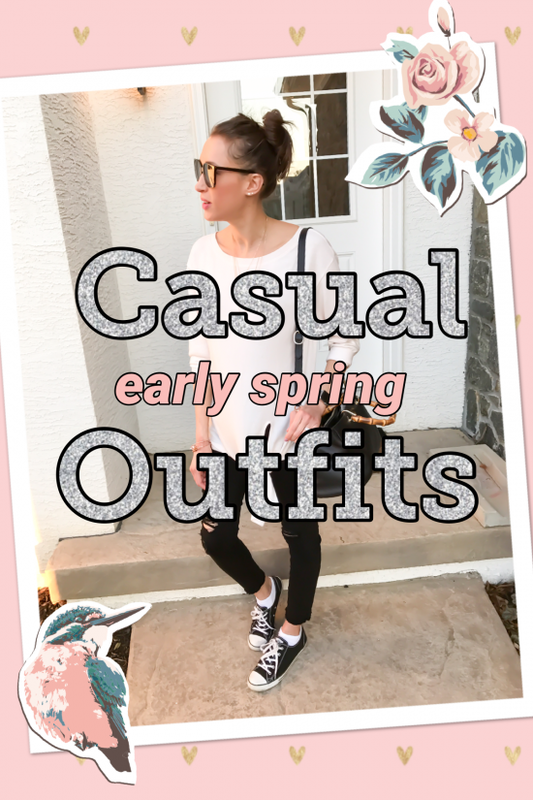 That’s why I’m armed with tons of early spring outfit ideas! Speaking of…I found this FP duster at Marshall’s. It allows me to make a fashion statement without wearing a jacket. Total 90s vibes here! 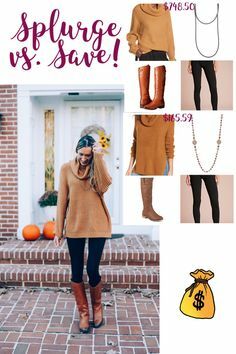 Shop my looks below each outfit! Early spring is the perfect time to wear long-sleeved tops that let your back play peek-a-boo. 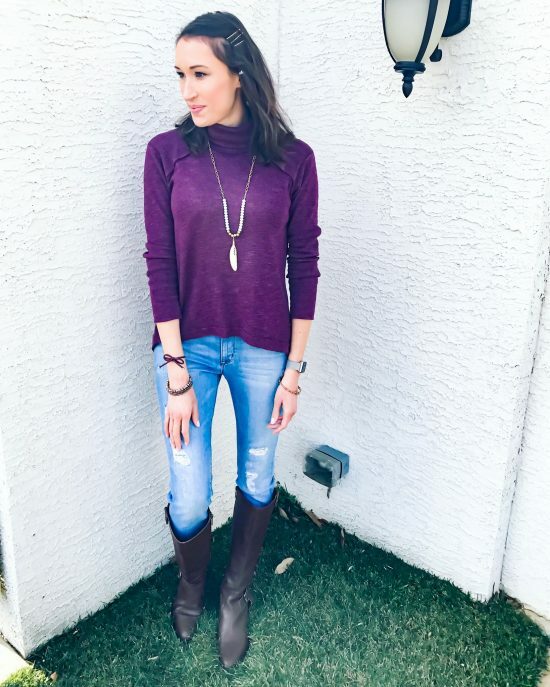 Pushing the sleeves up makes a turtleneck top look less wintery from the front, so you are still able to wear your favorite boots! 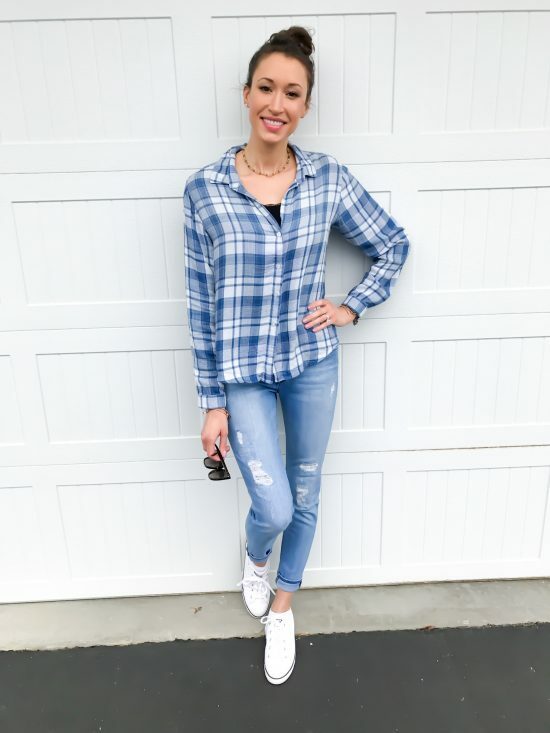 It’s also a breeze to wear long-sleeved button down tops in early spring because if the temperature is right, you can really show off any embellishments on the top. 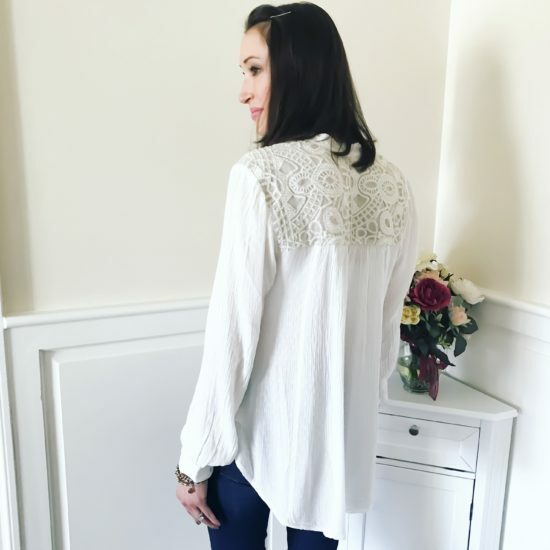 Try to wear tops like this Free People Canyon Rose Embellished Yoke Blouse when you don’t need a jacket. Add bootcut jeans for a casual boho chic vibe! This next top is also perfect for no-jacket-required days. Why would you want to hide the draped back! I added flowered hi-top converse to make the outfit even more interesting. Converse are always a classic choice, but they can be super quirky and fun when you sport a printed version! 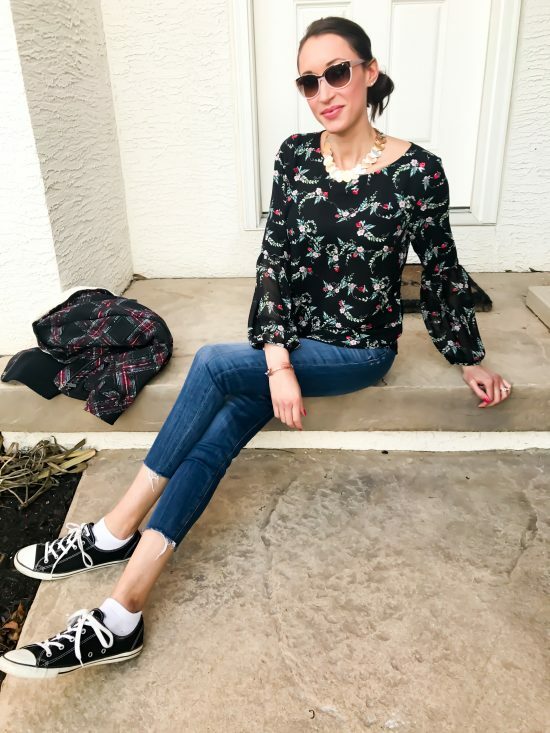 Sadly, this top and particular pair of Converse are no longer available, but I’ve linked some similar Free People sweaters and Chuck Taylor hi-tops below. My necklace is 60s vintage, and I got it from MeadowWoodJewelry on Etsy. All of the polished stones are cream-colored except for one, which is turquoise. Sleeveless sweaters are also suitable for early spring. In warmer environments, the large arm openings of this vest only call for a cami, but to keep warm, I layered the top over a basic tee. And yes, that is a jacket in my arms, but this top doesn’t have any embellishments in back. I couldn’t find this particular vest for you, but I have linked another below. I think I actually need to buy it! Take a look at the fringe! There is something so happy about pastels paired with black. I’ve got two options to show you, but the possibilities are really endless. So…This Hinge Tie-Front Top was hanging on the sale rack at Nordstrom. Turns out, it wasn’t really on sale, but I bought it anyway. Has that ever happened to you?? Anyway, this top is one of the softest fabrics ever and is actually a very pale blush pink. The mint green top with thumb holes (perfect for chilly days!) I am wearing below is actually by Free People, but since it’s pastel, I separated it from the above Free People outfits. Also, it was (and still is!) on sale. That same shopping day, I was on the hunt for some distressed black skinnies. 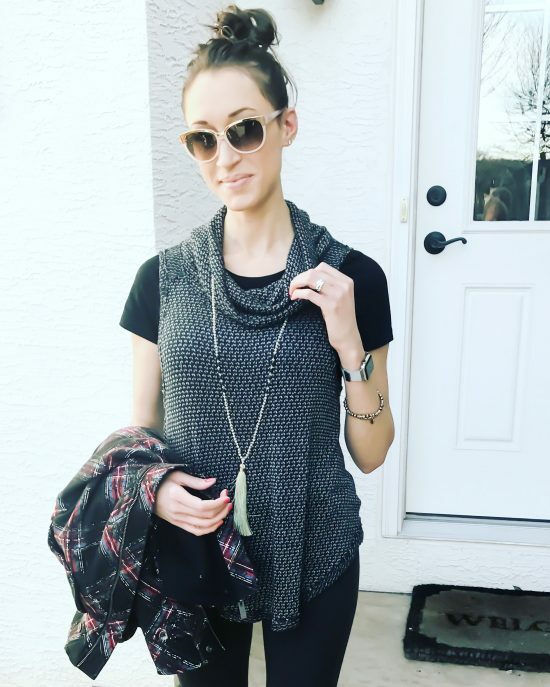 I had never heard of this brand before, but these Frame stretchy skinnies were worth every one of my pennies. Their comfort-level rivals my favorite LC Lauren Conrad leggings (which are on sale for $10 bucks!! ), but the distressing adds an element of intrigue. 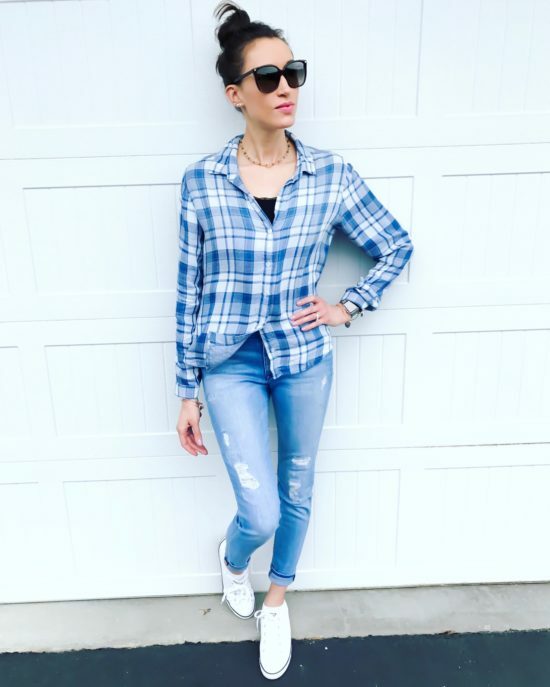 There’s something about light blue on light blue denim that just speaks spring, al fresco dining, ice cream-eating… I got this Cloth and Stone top at TJ Maxx last year. It’s so soft! 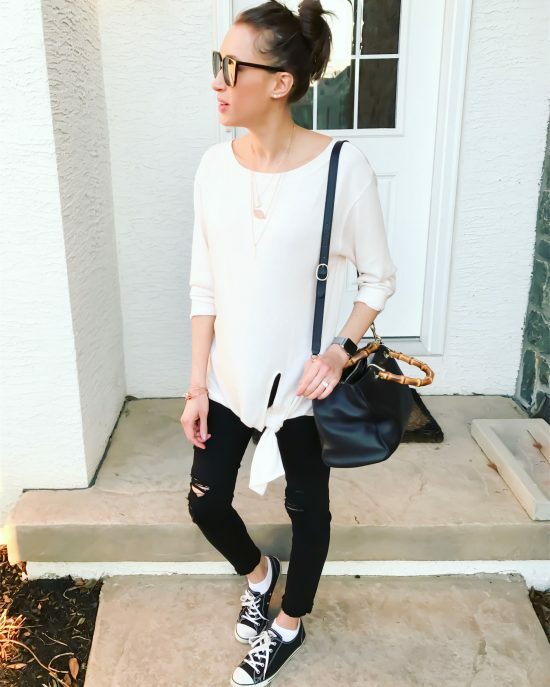 I added distressed light-wash skinnies and white Converse to keep the look light and fresh, just like spring. This Cable and Gauge sweatshirt is another TJ Maxx gem. Aside from the lovely shade of heather gray, I was sold when I saw the unique hemline! I have linked an extremely similar top for you. LC Lauren Conrad, like Free People, is a staple brand in my wardrobe. How cute is this print! Plus, you could easily dress up this top if you needed to, and the long sleeves are perfect for early spring. Lastly, here’s an outfit I created with the famed LuLaRoe Carly Dress. It does have short sleeves, so I covered up with an army-green button down and leggings. This chic early spring outfit is comfort at it’s finest, folks. 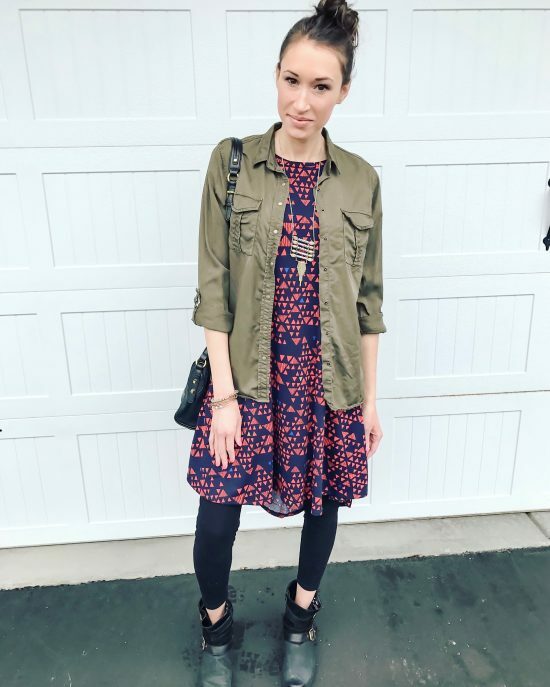 You should check out the other 9 looks I created with this dress and for sure check out LulaRoe Kate & Lea, who gave me the dress (which comes in infinite patterns and colors) and sponsored that post. It’s my most popular post to date, and it’s traffic just keeps growing! Don’t miss it! That’s whats up in spring fashion. 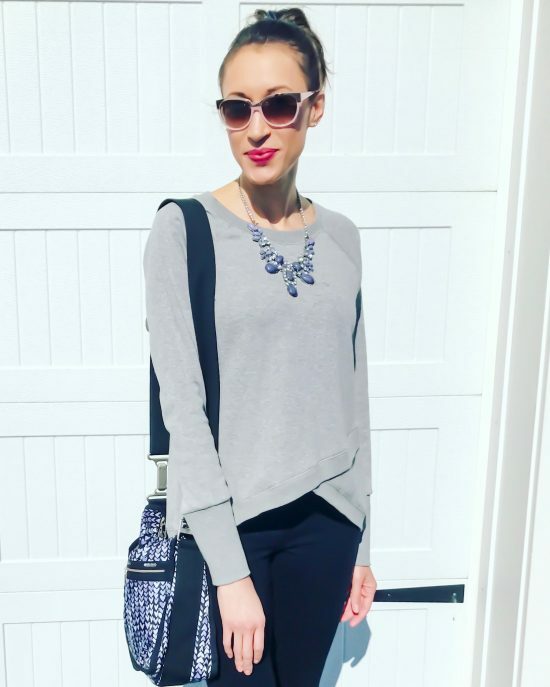 What do you think of my casual early spring outfit ideas? Which one is your favorite? I love all the outfits ! They all look great on you ! The purple shirt is so cute ! Love it . I love your converse high tops! Thank you so much, Abbie! Aren’t any Converse just so fun?! Nice work, my friend. You are a beauty, inside and out! All of these outfits hit the comfy mark for sure!! Great options and great prices too! 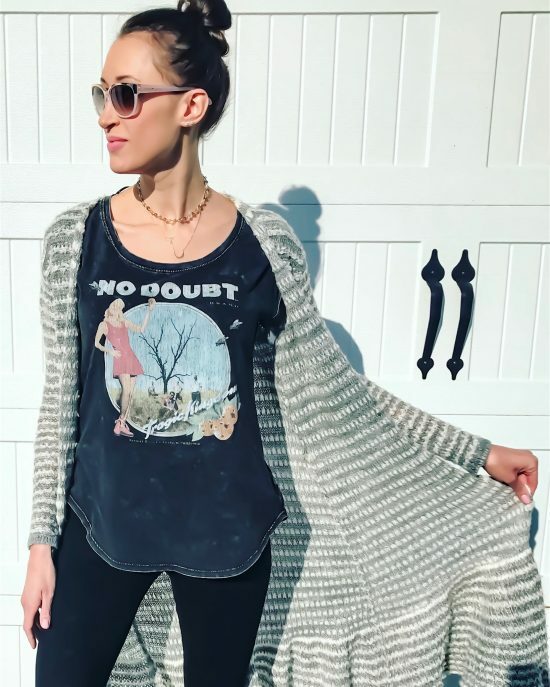 Comfy is key- especially for moms! Affordable is key for everyone! Thanks for reading. Pastels and black skinnies, yes please!!!! I love that tie front top and need it’s twin! Also those sunglasses you’re wearing in that too- love those!!! I haven’t seen any sleeveless sweaters but I’m totally drawn to that outfit… I’m about to cut off the sleeves on a sweater I don’t wear anymore orrrr I guess I could check out Free People before I do that! The lularoe dress is still my absolute favorite though!!!! You have got to get the top- It is super soft. I happened to be walking past the sunglasses to the makeup section, and of course I tried them on, and of COURSE I had to have them! Haha don’t cut up your sweaters- although that could be grounds for an awesome blog post haha. Free People is where it’s at! Thank you! I really can’t wear any of them today since we have blizzard conditions here. Moody weather! You have great taste, then. Thanks! I love all the outfits, so easy and so simple to do! I also love that you have an appreciation for Free People! Thanks for sharing! Isn’t Free People one of the best brands ever?! Thanks! That cardigan is so useful…thanks! I am in LOVE with the Free People Blouse, I need to get it! The white one? It was the only one in the store when I picked it up a couple of months ago. And it was on sale! These outfits are so cute! Free People is one of my favorite brands so I totally agree with your obsession! I cannot resist buying their stuff. It’s a big challenge not to overspend! Love this! 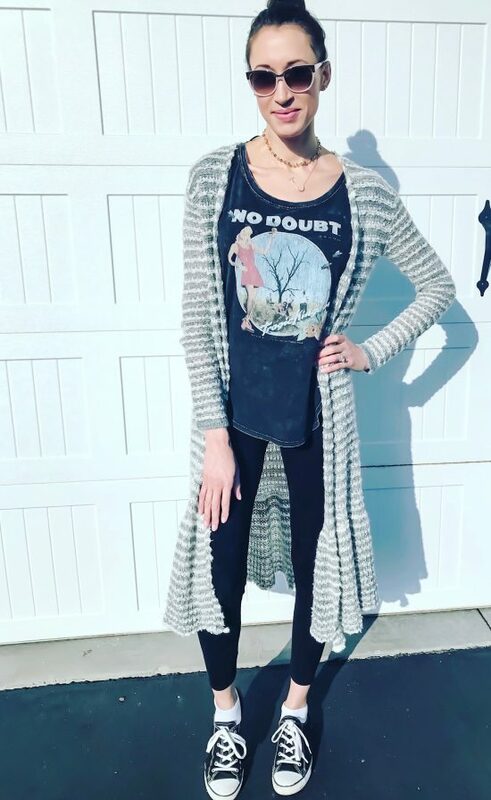 Also really love that No Doubt shirt. I was thinking about this yesterday that when you see spring clothes the only thing advertised is super cute things that I can’t wear until mid or end of May. I’m from NY and spring doesn’t truly kick in till May. Like today, in the forties raining and freezing. At least you get it. Lol. Right??! I’m over near Philadelphia, so spring doesn’t always mean warm! Definitely need to keep up the wardrobe cuteness during those odd temps! I am in love with the army green shirt! It is perfect to pair it with any dress. Love it! Thank you! It’s so soft, too! I had no idea I would find someone else who loves LC as much as I do. That top is adorable. I looove all of her stuff!! These are some great outfits. Love all the details you have in your blouses!! Love LC so much! I haven’t been to Kohl’s in a couple of months and I am chomping at the bit haha. Need some summery LC items! Thanks for reading!